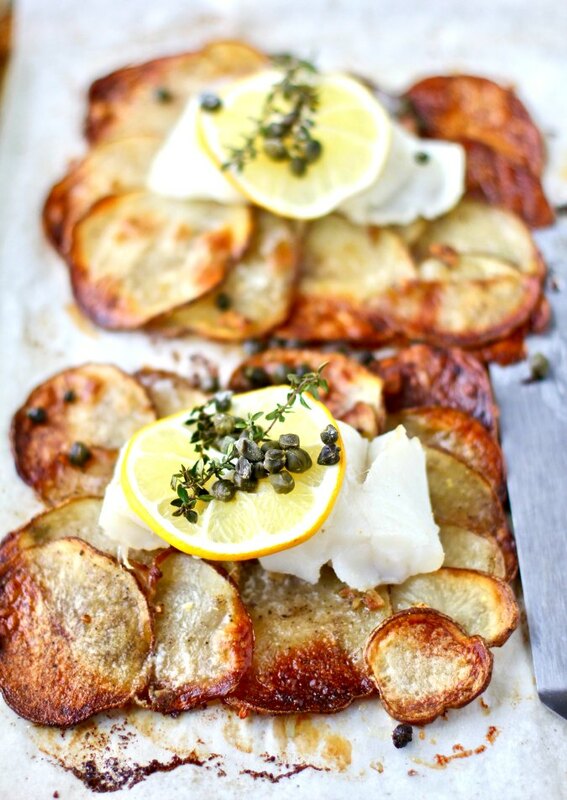 This sheet pan cod is baked on crispy and garlicky rafts of thinly sliced potatoes and topped with lemon, thyme, and capers. 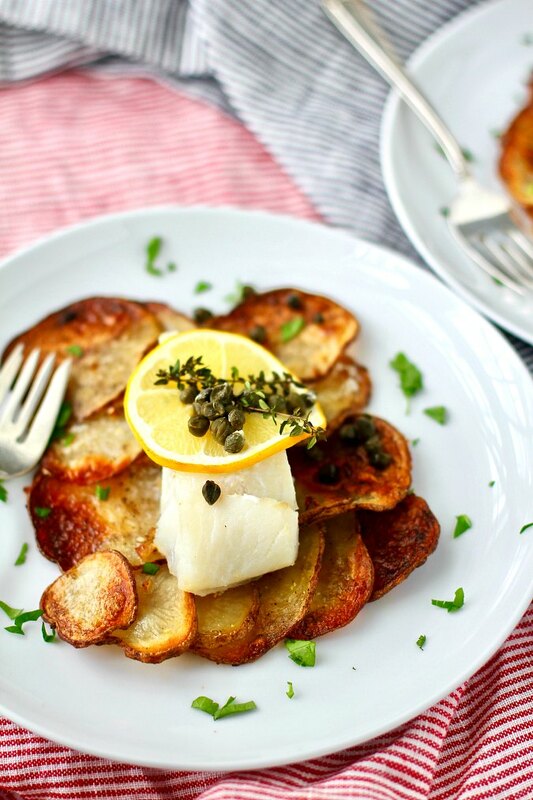 This recipe for the crispy and garlicky potatoes topped with cod is easy to assemble and bake in the oven. 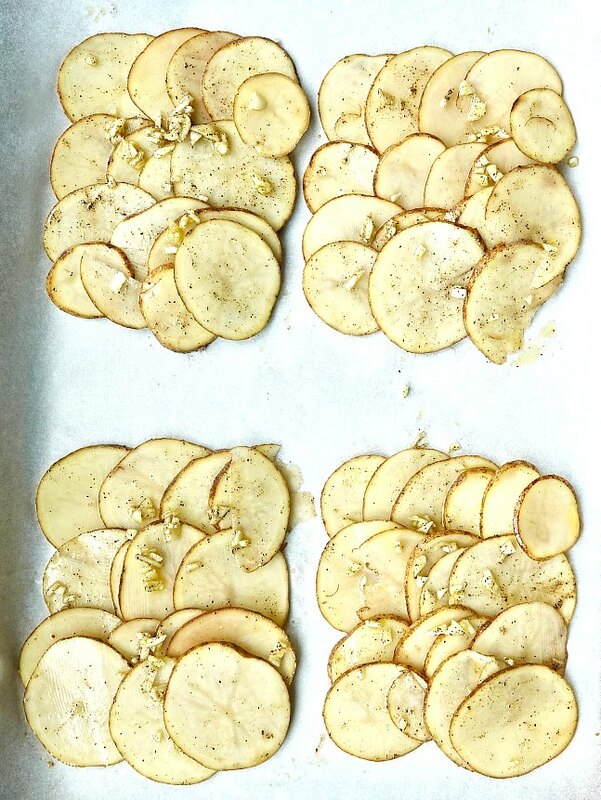 All you need to do is thinly slice the potatoes, toss them in olive oil, garlic, salt, and pepper, and then arrange them on a baking sheet by overlapping the slices in shingled rows. I used this mandoline to thinly slice the potatoes. If you're really good at thinly slicing potatoes with a knife, you don't necessarily need a slicer, but this one made fast work of slicing the potatoes. I bought it a few years ago after seeing it recommended by Cook's Illustrated. Plus, I never met a kitchen gadget I didn't like. After you've sliced and arranged the potatoes on your sheet pan, you bake them all by themselves in a 425 degree F oven for 30 minutes. Next, you top them with the fish, butter, some lemon slices, thyme, and capers, and bake them for about 15 minutes more, until the potatoes are all crispy and the fish is just cooked through and flaky. Once I pulled these cod and potato rafts from the oven, it was really hard for me not to pick away at the edges of the potatoes for extra tastes before serving them. They were kind of like crispy tender garlicky warm potato chips..... soooo good and exactly what I was craving. I loved, loved, loved these baked cod and potato rafts. I only used 4 ounces of cod per serving, but you could easily double that if you'd like more fish. You won't regret making this dish. You can also substitute sole, haddock, or halibut for the cod if you prefer. This recipe is super flexible. I never really associate fish with potatoes, with the exception of fish and chips. This dish kind of takes fish and chips to another level! This is such an easy dish to make. Serve it with a salad and dinner rolls and you have an elegant and delicious dinner. It's scalable and perfect for dinner for two or four. Your guests will love you. This month, the Fish Friday Foodies' theme, chosen by Caroline of Caroline's Cooking, is Fresh from the Oven. Fish Friday Foodies is organized once a month by my friend Wendy of A Day in the Life on the Farm. Be sure to check out everyone's oven baked fish dishes! Heat the oven to 425 degrees F. Line a half sheet pan with parchment paper. Toss the potatoes with the olive oil, garlic, salt, and pepper until the potatoes are thoroughly coated. Assemble four potato rafts by overlapping the potato slices into 4 by 5 inch rectangles. Place the sheet pan in the oven on the center rack and bake for 30 minutes. 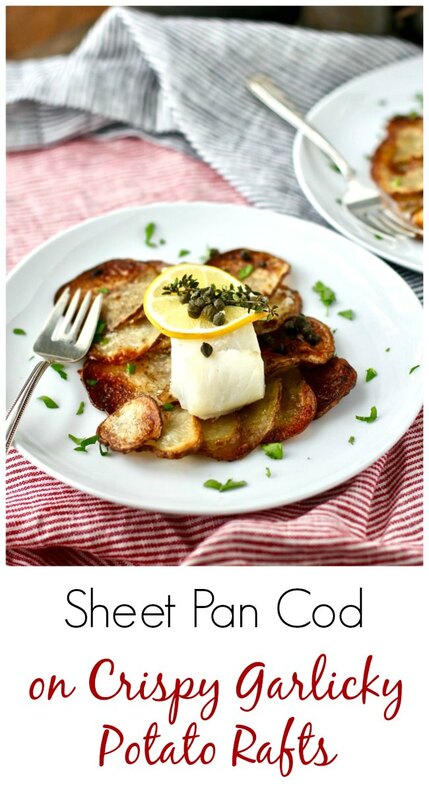 Remove the pan from the oven and top each potato "raft" with a cod fillet. Top each piece of fish with a tablespoon of butter, a lemon slice, and two sprigs of thyme. Sprinkle with the capers. Return the pan to the oven and bake for an additional 15 minutes, until the fish is just opaque and flaky. 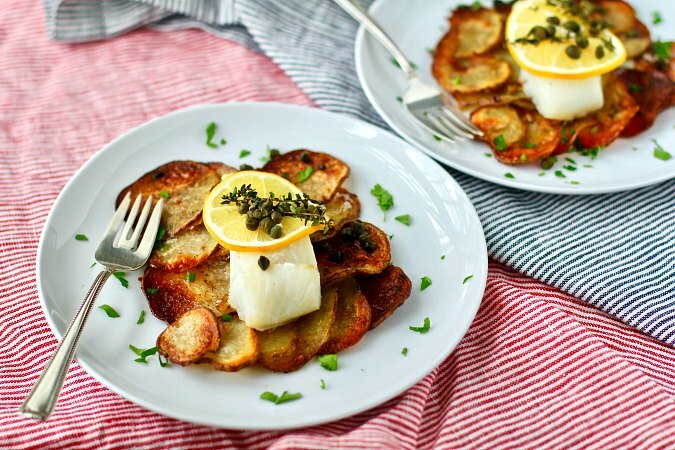 With a large spatula, transfer the fish topped potato rafts to plates and serve! This recipe was adapted from the book Sheet Pan Suppers: 120 Recipes for Simple, Surprising, Hands-off Meals Straight from the Oven *Plus Breakfasts. Desserts. and Snacks too! It's loaded with fantastic recipes. How to get behind the scenes with Karen's Kitchen Stories? I would love it if you would follow me on Instagram. It’s a great way to stay up to date on all the latest and greatest blog recipes. Plus, on the weekends, I post IG stories of my horribly messy kitchen. Karen, this sounds amazing and what a great presentation. Perfect for guests as well as family. Thanks Wendy. I can't wait to make it again. This looks and sounds great, I love the idea of those potato "rafts". There is lot of flavor in this plate, love those garlicky rafts.